Brian Lin is on Shark Tank seeking an investment in Emazing Lights. 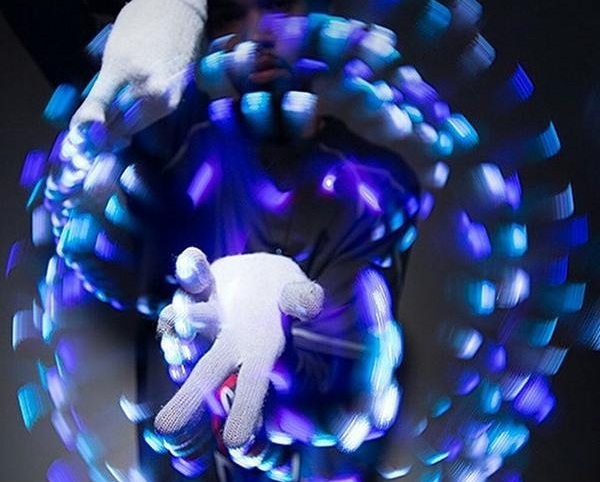 They’re specially designed gloves with lights on the fingertips, used for putting on a dance performance in the dark — at clubs and other dark venues. Lin is asking for an investment of $650k and offering a 5% equity in his company. He says that ‘gloving’ is already moving from a subculture to pop culture, and that he expects it to continue to grow. Since he started, he says, he’s grossed over $13 million, and he expects to have another $5.5 million in sales this year. However, it’s not just the gloves — he’s split some of the profits into another line called IHeartRaves, which markets other goods to ‘festival-goers’ and has netted another $1.4 million, and is expected to make another $2.5 million this year. The products range from $20-120, with the higher-end products offering more programming options, and profits range from $10-17 per unit. Kevin O’Leary was first in with an offer, saying that the potentially transient nature of the product — which might only be a fad — worried him, so he’d offer a loan rather than an investment. He’d loan the $650k, for a 3% stake. Lin declined without hesitation, saying he wasn’t looking for a loan — and Kevin accepted, saying that in that case he was out. Daymond John had a concern — why such a small offer? Sharks don’t get out of bed excited to get 5%. Lin asked what percent the sharks would need to get involved. Daymond said he’d make an offer — he’d invest the asked $650k, for 20% not of the whole company, but of the licensing deals that resulted from the agreement. Robert Herjavec and Lori Greiner had an offer to make together. They’d offer $1 million, for 8% equity. Mark Cuban had an offer too, and he felt he had an offer that would make a deal with him a real steal: he’d give the $650k investment, but he’d also get Lin in for a halftime show with the Dallas Mavericks, and let him demonstrate the product there. He then brought Daymond into it: they’d do the deal together, Daymond would still do the licensing as suggested, and would take 20% of licensing returns, as he’d offered. The sharks began to squabble over their relative values, and Herjavec interjected to assure that, he, too, could get Lin into arenas to show his product. He announced that he and Lori were modifying their offer: $1 million, for only a 5% stake. After what must’ve been a difficult ponder, Brian made his decision. He thanked Lori and Robert for their offer, and took the deal with Mark and Daymond. Final Deal: Mark Cuban and Daymond John invested $650k together in Emazing Lights for a 5% stake for Mark, and 20% of licensing values for Daymond.